More than a thousand online poker players will compete for a prize pool to top more than $10,000 – and bragging rights for their favourite poker community – at the next Online Forum Challenge (http://www.onlineforumchallenge.com/) on November 24 and 25. 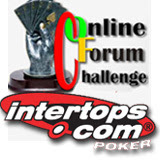 Sponsored by IntertopsPoker (www.Intertopspoker.com), players can win cash and prizes for themselves– including a satellite seat at the World Poker Open in Tunica – and represent their favourite online poker forum in a huge inter-forum challenge tournament. Day One of the tournament is a free roll with a $2,000 cash prize from Intertops and $500 in forum prizes. Day Two is a $5 + $.50 buy-in with $2,000 added to the buy-ins at stake, as well as two bonus prizes. Intertops will be depositing $200 a month to the winner’s account for a full year. They will also pay the winner’s way to the World Poker Open in Tunica, MS next January where they’ll have a chance to win a $10,000 buy-in for the WPT Main Event. Prize Pool: $2,000 added to buy-ins + $2,400 Intertops Poker Payday + satellite seat at the World Poker Open in Tunica. The World Poker Open prize package includes a seat at the World Poker Open “$1,000 + $60 Super Satellite” at MGM’s Gold Strike Casino Resort next January, as well as travel expenses. Players must pre-register at OnlineForumChallenge.com. To be eligible for these events, players must first be registered at IntertopsPoker.com. Tournament details, including prizes and registration, are available at OnlineForumChallenge.com.